Launch Parallels Desktop.app, but do not start your virtual machine. 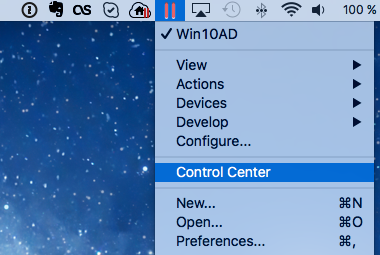 Click on the Parallels icon on the Mac menu bar > select Control Center. Right-click on your virtual machine and select Remove. Select Keep files if you wish to access the files from this virtual machine later. The virtual machine will be removed from the list, but it will remain in its original location. Select Move to Trash, if you do not need any data from this virtual machine and want to erase it completely. WARNING: The Move to Trash operation is irreversible. After moving the VM to Trash you will not be able to restore it. If you have already deleted Parallels Desktop from your Mac, see KB 117333 for instructions to locate the VM on your Mac and then move it to Trash. 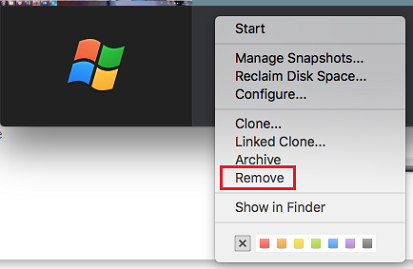 To know how to remove a virtual machine from Parallels Desktop but to keep its files for future use, please read this blog post: How to Remove a VM…and Bring It Back Again.